Looking for a job – what happened next? A few months ago, Emma wrote a piece for us about the problems disabled people face whilst job-hunting. The article was written about her own experiences of job-hunting from a wheelchair and, after many failed applications and interviews, it ended on a high note. Emma got the job she wanted. I work in medical research at a well-respected University, the University I had graduated from only 18 months before joining their staff. To most people medical research conjures up images of injecting rodents with various chemicals, and trying to avoid Planet of the Apes from happening. I am not involved at all with such proceedings; in fact, all of the studies I work on are clinical trials on humans only. It is a varied role. My main responsibilities include managing data that comes in from the hospitals, checking for obvious errors, inconsistencies, or missing pieces of information. I liaise with research nurses to clarify these problems, and prepare the data for the statistics team. I also help code the computer programs we use that allow us to transfer paper-based data onto an electronic database, and put together algorithms that then search this database for particular features, so that the statistics team may use these features in their analysis. I also help book meetings, make sure all documentation is up to the strict legal standards expected of us, and provide hospitals with the resources they need to carry out our study. This may seem much less exciting than trying to avoid Planet of the Apes, with it being almost entirely deskbound and computer-reliant, but I love it. About two weeks before I started, I met with my new employer to discuss my particular needs. This was a complete surprise to me as I had not asked for this, and my previous employer had waited until I was 5 months into the role before offering me any kind of assistance. I met with my line manager, one of the business managers, and an occupational therapist to discuss the adaptions I might need. By the end of the meeting I would be receiving a new keyboard that would reduce my wrist pain while typing, a special mouse, an orthopedic chair that would support my back and had arms I could lean on for standing up, and a height-adjustable desk. They also rearranged the office seating plan so that I could have a desk next to the cabinets I would be using most often, near my line manager for the many occasions on which I would need his help, and also had a plug socket where I could charge my wheelchair. I was amazed; no one had ever gone to such lengths to accommodate me before. In the first two weeks of my employment alone I went to two important meetings, both in highly accessible rooms. When I entered each meeting room, someone nearby would pull a chair out from under a desk, leaving me space to park up. I was never segregated from the group, something which I have found endlessly useful team discussions. I also had training sessions and not once did I have to worry about inaccessibility. Even all of the social events were accessible, and so I quickly grew to know my colleagues well. At the start of January, a situation arose which could have led to me not having a wheelchair for a month or more. As soon as I was aware that this was a possibility, I notified my line manager, fully expecting to be thanked for the intel but also to be told it was my problem. Over the coming week emails were sent and meetings held focused entirely on what they could should the worst happen. This included taxi fares if I had to use my walking frame (as I couldn’t walk even the bus stop), and the cost of hiring a wheelchair. Fortunately, the situation was eventually resolved and I was never left without a wheelchair, but the length which my colleagues and managers went to left me astounded. I realise that I am incredibly lucky. I have amazing colleagues, an understanding line manager, and work in a place I was already familiar with so knew was accessible. In fact, Universities are often good places for disabled employees given the lengths they are required to go to when providing equal access to education. I am fortunate to have a job I genuinely like and find interesting. I am also lucky in that the one issue I have had regarding access was resolved fairly quickly and has not happened since. Not all employers are like this, certainly not the people who employed me before this! However, it is possible for disabled people to become valued employees and contributors in the workplace, often with just a few relatively small adaptations. Being in full time work with a chronic illness is, on many levels quite frankly insane, and is also indescribably difficult, but I honestly wouldn’t choose to have it any other way. 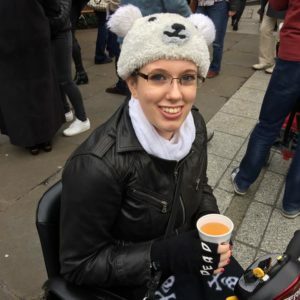 Emma has her own blog, Diary of a Disabled Person, where she writes about anything and everything relating to disability, both good and bad.